english version. deutsche Version. versión española. Do you want to buy paper products manufactured by the world's biggest and best paper mills at bargain prices? With PPSE it is possible! 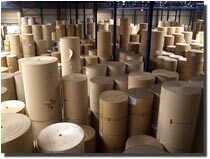 PPSE turns over about 240,000 metric tons of paper yearly, from well known paper mills and is one of the biggest stock-lot traders for corrugated, printing and special papers world wide. PPSE buys in large quantities of corrugated, printing and special papers from more than 30 well known producers and trades world wide to save you money! We give Our Customers value and service second to none. We have provided our customers great value and economy in corrugated, printing and special papers for several years. PPSE stands for top quality at attractive prices! From March 30th - April 1st, 2008 You can meet PPSE on the Paper Week at The Waldorf-Astoria Hotel in New York City. To arrange a date with us please contact the administration.